Oil of black cumin (Nigella sativa) is produced from the seeds, the process of a mild cold pressing and filtration afforded a clear brownish oil aroma and slightly of bitter taste. It contains about 84% unsaturated fatty acids, valuable fatty substances like sterols and vitamins E, as well as traces of essential oil. That is why it is one of the high quality dietary supplements. 500 mg pure Egyptian black cumin oil per capsule. Black cumin oil contains a high proportion of biologically active and multiply unsaturated fatty acids. 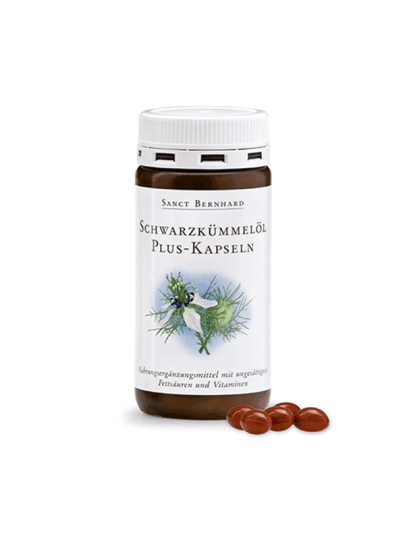 Nutrition supplement containing even vitamin E, pantothenic acid, folic acid, vitamin D3 and biotin. 180 capsules = 1 capsule per day = enough for 6 months of use! Cold-pressed black cumin oil (Nigella sativa), gelatin, humectant: glycerol, thickener: silicon dioxide, D-alpha tocopherol, calcium-D-pantothenate, color: iron oxide, emulsifier: soy lecithin, cholecalciferol, pteroilmonoglutamic acid, D-biotin .